It’s a drizzly morning and I’m back on the road. Wish I could stay another day (week) in the state forest. Three young Mennonite children driving a pony cart by themselves along the side of the road. The oldest was a boy of maybe ten, with a younger boy and a girl between them. Arrived at my cousin’s house in Connecticut. I’ll be using her driveway as a base for a couple weeks as I visit lots of family in the area, and get a break from long distance driving for a bit. I have driven across 2/3 of the country in the month and a half since I left New Mexico, and have been living in the van for 3 1/2 months. Feels like longer, but in a good way. Like I am already used to Serenity and think of her as home. I don’t have all the quirks of the lifestyle figured out yet, but am already thinking of this as a long-term living situation. After an unusually warm few weeks, it is finally getting colder, with the first overnight frost the day after I arrived. The van insulation is still keeping me warm enough, but not really warm. Even with extra blankets on my bed, a balaclava and two knit caps, I’m still curled up and shivering. Since I’ve sworn off propane, I needed another heating option. I ended up getting a 12V electric lap blanket for cars, put it in my cocoon next to my skin, and it keeps me nice and toasty at night. Random van tip: I’ve been storing my extra blankets on my bed, laid out in full under the mattress. That way they take up virtually no space and provide a tiny bit of extra cush to the mattress. Here’s the weird thing. It’s been below freezing every night, but in the 70s by day. I’ve literally worn a spaghetti strap top with shorts, and then thermals under sweats in the same 24 hour period. Another thing I’ve learned about van living: Insulation works both ways. No matter how much or how good the insulation is, the van’s temperature will eventually equalize with outside temperature. In a freezing night, that means that by the early hours of the morning it will be just as cold as outside and will hold onto that cold when the morning starts warming up outside. After a freezing night, going outside in the morning could actually be warmer. One good thing about the cold nights is that my cousin started up the wood furnace. I love the smell of their house with the wood stove going. It is the smell I most associate with her and with Connecticut. We’ve also gotten in some crafting time—I made three hardcover journals—and I’ve enjoyed cooking together and helping around the house. While I’m there, I might as well be useful. She has a dehydrator and I still had some apples from the farmer’s market, so I put the two together and managed to dehydrate more apples than I ate (though it was close for a while) and my very first batch of sprouts is coming along well. Someone recently shared some research with me about how broccoli (specifically the sulforaphane in broccoli, kale, and other coniferous vegetables) is supposed to calm some of the symptoms associated with autism. I haven’t noticed any difference, but broccoli is very healthy and the sprouts are surprisingly tasty. I’ve also started adding a handful of kale to my morning smoothies, which I had heard about before but always though would be nasty. It turns out that although it effectively turns the entire smoothie green, I can’t taste it at all. So, yay health bonus with no flavor downside! 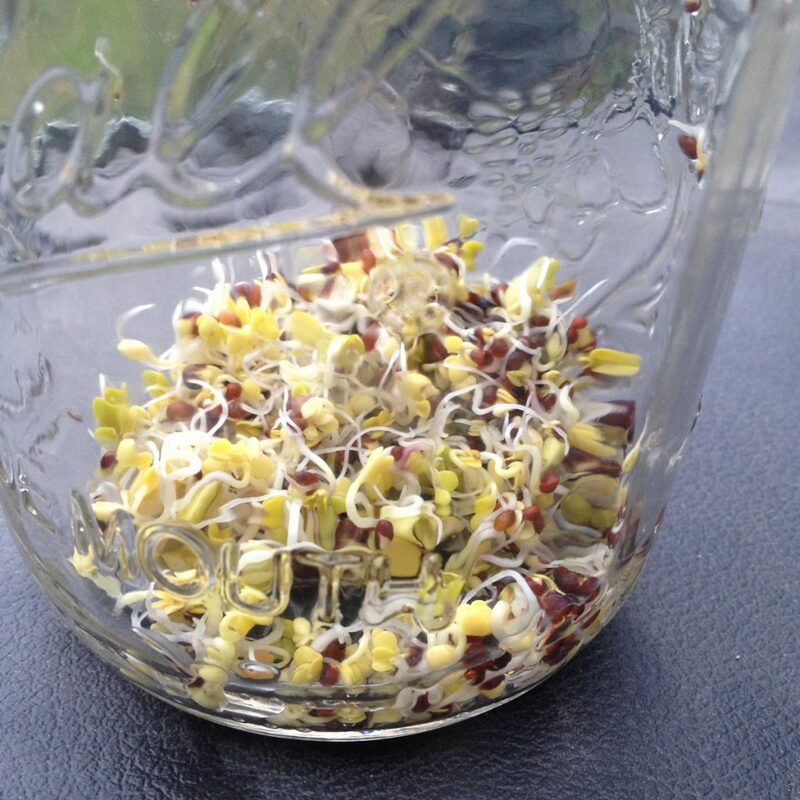 Broccoli sprouts in a mason jar. I also spent my first night in an industrial parking lot, trying to blend in with the other nondescript white vans. Slept pretty well, and had absolutely no problems, not even a hint of a possible problem, but I was still a bit on edge the whole night, wondering if there would be a problem. It’s nice to know this option is available, but I think I’ll mostly stick to Walmart parking lots when I’m not at someone’s house or out in nature. At least there are other people around and they have security. 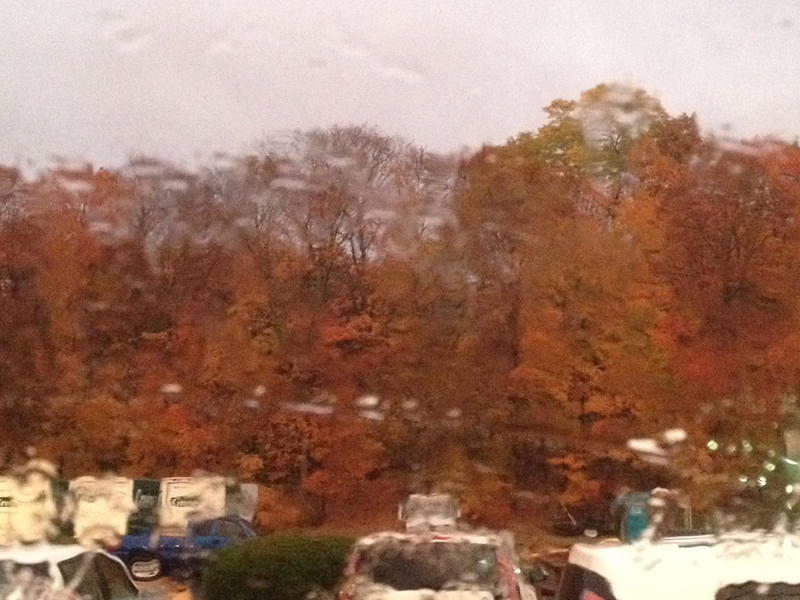 Awoke to the rainy orange scene in the picture at top. One thing I love about the New England states is that even in cities and urban areas, there are frequently these little pockets of nature softening the hard industrial feel of cities. I also splurged and bought a Groupon for a local climbing gym. A two week pass for $22! It felt so good to climb again! It is my meditation. When I’m on the climbing wall, or climbing rocks outdoors, it is impossible to think of anything else. Getting distracted gets you hurt. But it is also a relaxed focus that lets me explore how to make that next move. So my mind is only on the wall and my body, my body and the wall. I went seven times in those two weeks, mostly during the day when it wasn’t crowded. My big takeaway: I am very glad I started using a manual blender eight months ago! That bit of arm exercise every day is really coming in handy now. Because the trick to rock climbing seems to be learning to suspend your entire body from increasingly improbable holds. I love rock climbing. I did some as a teenager and a bit off and on since, but frankly, it is intimidating. Not the rock climbing itself, but being around other rock climbers or watching their videos online or reading how-to books. It seems like climbers all fit into one of two categories: either they are very experienced, strong, able to dangle from ridiculous ledges and never get tired, or they are complete beginners and don’t know what a carabiner is or how to tie a knot. I don’t fit in either group. I’m not particularly strong or experienced or able to brag about impressive routes I’ve climbed, but I know which way is up, how to tie in and how to keep myself safe. I know the basic moves, even if doing them doesn’t look impressive yet, and my stamina is about as long as a goldfish’s memory. But my category, the category in the middle, doesn’t exist in the rock climbing world. I mean, of course it exists. It must in theory exist. None of those seeming-experts got so good if they didn’t start somewhere. But to look at the climbing videos on YouTube, you wouldn’t know it. They are all the basics for beginners type or showing off fabulous feats. And in climbing gyms it is the same. There are the occasional first timers coming in and everyone encourages them, but they rarely stick around for long. Maybe because they have no peers. On the other end of the spectrum, both the macho guys and the macho-imitating women are all muscle and tendon, casually bragging about the impressive routes they’ve mastered and trading tips about the routes that are challenging them in a spirit of camaraderie and sportsmanship—except that these routes are too advanced for me to even dream of. And the classes offered are all geared toward strength or endurance training for people who already have a good deal of strength and endurance (from my perspective). Even the kids who come to climb seem to be stronger than me, relative to their body mass. I want a class for the mediocre climber. A support group or climbing night or video series for the no-longer-beginner-but-still-in-training-climber, that is not condescending or pandering, but feels genuinely encouraging for those of us who want to build the strength and stamina to eventually get to the more advanced routes. I’m tired of joining a class only to lag behind the entire time, even after modifying the skills to do fewer reps or for less time. Or being treated like I don’t have a clue just because I don’t have a lot of experience. Or feeling like I’m getting in the way of people who have more right to be there. It was easier when I was a teenager and no one expected me to be great already. Kids are encouraged to do as much as they can, pushed a little as appropriate but not shamed for not being better than they can be. At least that was my supportive-environment experience. As an adult, it is a different world. I’m supposed to have been climbing since I was a kid and able to leap tall buildings in a single bound. Maybe what I really want is a world that gives everyone a fair chance. Maybe that is too much to ask. Maybe I should stop dreaming. Maybe I am angry precisely because I have hope. Sigh. But I’m not going to let that hope die. I know the world will never be the egalitarian paradise that the French Revolution wanted to create (and badly botched up). The world isn’t populated with saints, it is filled with normal people, who are broken and hurt and therefore do awful things to each other. But we also have the seeds of sainthood in each of us, in even the most broken and hurt among us, and therefore we also make breathtaking beauty and act with extraordinary kindness. I completed a 5.6 level route at the climbing gym, after several days of concerted trying, and repeated this impressive feat the next day. For context, 5.6 is pretty much a beginner’s route, but I’m proud of myself. And will keep up with the manual blender. Am I alone in feeling out of place in the intermediate range? It can’t be just rock climbing, I think this is a common phenomenon. Tell me about your experiences in the comments. What have you done to persevere through it? I’d love some tips. Hi! I have read three of your posts today and it sounds like you are setteling in to your life in the road. good for you to be concerned with the aspect of exercise and good eating. Keep posting.